It's not unusual for problems to arise between siblings caring for elderly parents, including disagreements about money issues, care options, how to divide the workload and end-of-life decisions. Choosing in-home care is one of those stress points. Hopefully, this will help. As a caregiver, you may have a need to find a home care agency quickly due to an emergency such as a fall. If you are lucky, may have time to investigate and compare options with other family members. Selecting an agency is both emotional and financial. Paid in-home care can be expensive depending on the number of hours required and the duration. Several years ago, my mom had a fall and needed help with a number of daily living activities such as bathing, cooking, cleaning, dressing, etc. She was adamant that no one could be in her home. In our case, in-home care wasn’t our best option, because she required ongoing care many hours of the day. There are more than 5,000 Senior Home Care Agencies nationwide – Home Instead is the largest with over 1,000 offices globally. There are many other franchise organizations like Home Instead including Visiting Angles, Comfort Keepers, Brightstar, Home Helpers and thousands of independent, local providers. This leads to the dilemma of how does one choose. Having been though this with my mom I know how frustrating it can be. Following is what I learned. Terminology can be confusing. For example “Home Health Agency” may include both Medicare and Medicaid approved Home Care Agencies and Non-medical Senior Home Care Agencies. Non-medical Agencies hire both Companion Caregivers and Certified Nursing Aides, who assist with hands-on care for all Activities of Daily Living. Medicare-approved Home Health Agencies provide intermittent visits by a R.N., Physical Therapist, Occupational Therapist, and Speech Therapist, with pre-approval of these services by a Medical Doctor. These are considered “skilled” care services. Senior Home Care Agencies are referred to as “non-medical” because they are not providing services which would need to be managed by a Medical Doctor. Many providers are part of national or regional chain and as such, they are franchises. Many owners are couples and they enter the business because they have an affinity to help people and yes… need to make a profit. The caregiver they provide to help you is their employee and they are responsible for all legal and financial aspect of their compensation. So if you hired a private person and they fell in your home, you would be responsible. Not so for a reputable home care agency. Will you also need a professional care manager to coordinate needs such as doctors’ appointments and medications? If so, you should consider contacting a Geriatric Care Manager. They will work with you to take care of care you are unable to provide. They can also help you with long-term care decisions. They are experts and this is what they do. If a language, other than English is required, let the agency know. Provide a list of all medications taken, dosages, times taken and any special requirements such as the need to take with meals. Talk to the agency about any potential side effects. Who will organize the medications? Frequently these are organized in a pill box on a regular basis. Who will be responsible for obtaining refills. If any degree of memory loss is involved, be sure to let the agency know as they may recommend someone with expertise with Alzheimer’s, etc. Are there special nutrition needs such as food allergies, swallowing issues (dysphasia) or menu requests? How will groceries be purchased? There are services such as Meals on Wheels and Seattle Sutton that can provide nutritious, prepared meals, delivered right to the home. How many hours of care will you need – per day and throughout the week. What times and for how long? Sometimes care is only needed for a short time as a loved one works through rehab. Other times it may be needed on an ongoing basis. Short term respite care is also another use. Are there requirements for skilled care? This could include performing diagnostic procedures (blood pressure or blood sugar), wound care, etc. Sometimes you might require the caregiver to take your loved one to the store, a doctor’s appointment or other activity. Often, the caregiver will provide the transportation and bill you for a mileage charge. There are no national licensure requirements for non-medical Senior Home Care Agencies although we expect this will occur in the future. That’s why you should consider one of the leading national or regional chains. They are more likely to be in compliance with the items below. That is not to say that local caregivers and local agencies aren’t in full compliance and won’t offer service as good as or better than franchises. Are their caregivers employees of the agency, not a contractor to you. How do they prepare a care plan? How are their caregivers trained? How likely would current and previous customers recommend them – ask about survey results. We are working on preparing a comparative chart which will show all the major franchise in-home care service providers with information across each of the ten criteria. We will also be providing you with a checklist that you will be able to print out and provide to each of the companies you might consider. We have a fantastic booklet titled Care for the Family Caregiver that we provide to caregivers and their loved ones. This 42 page booklet, prepared by Emblem Health and the National Alliance for Caregiving is the best I've seen on caregiving. It is chock full of helpful tips in a very easy to read and beautifully laid out, colorful format. 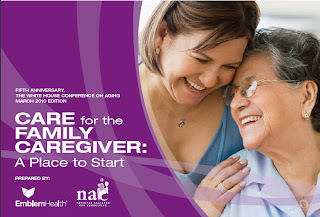 It includes Family Caregiver Stories, What is a Caregiver?, Family Caregivers: The Backbone of Long Term Care, Trends in Caregiving, Helpful Tips, Training, Navigating The Healthcare Maze, Taking Care of Yourself, Financial & Legal Aspects and Resources and References. It also includes a bonus Caregiver Advocates and Resources pamphlet.